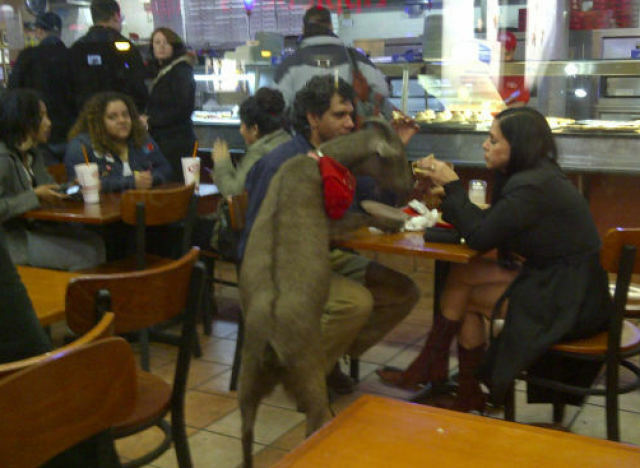 Last week at Famous Famiglia restaurant in Midtown, Manhattan, a goat was spotted eating pizza inside the restaurant. A couple was dining at the restaurant on Wednesday night at around 11pm, and a goat which reportedly belonged to them began eating pizza with them as well, placing its two front hooves on the table, while the woman fed it pizza from her slice which appeared to have spinach on it. Soon enough a crowd began to gather around the unlikely trio and people passing outside began snapping photos of the unlikely restaurant-guest and its Italian-style meal. The couple continued to feed the goat and paid little attention to the crowd that had gathered around them. The goat was reportedly the size of a large dog, and wore a red leash. Famous Famiglia Pizza on 50th and Broadway has had famous visitors before, chosen as the location for a “pizza summit” in 2011 with Donald Trump and Sarah Palin. This goat has received it’s fare share of media attention recently, as the subject of several online articles and now with its own twitter account, @pizza_goat. Famous Famiglia worker Lona Asaneni said “I don’t know who let the goats in because we normally don’t even let dogs in, but it’s big news around the pizza joint”. Others theorized that the goat may have been a service animal or a “seeing-eye goat”. Some customers were concerned about the sanity of having a goat eat with them, but most simply appreciated the humor of the situation. Famous Famiglia Pizza is one of New York City’s premiere pizza establishments, and if you would like to eat as well as a goat, you can order online and try their food here. Ordering now gets you 5% off, we like to call it the goat special. Previous Entry:Zagat Survey is now Out!